Buy Zuggsoft T-shirts, mugs and more! Programs used to play online text-based "MUD" adventure games. CMUD is the new MUD/Telnet client from the creators of zMUD, designed specifically for Windows XP and Windows 7. Play over 2,000 text-based MUD games on the Internet. NOTE: For upgrade pricing, be sure to log into your Store account. See the full list of new features in CMUD v3. If you are using an older version of Windows, please buy zMUD instead. CMUD PRO is the new MUD/Telnet/SSH client from the creators of zMUD, designed specifically for Windows XP and Vista. Play over 2,000 text-based MUD games on the Internet. See the full list of new features in CMUDPro v3. This is an OLDER version of CMUD. CMUD is the MUD/Telnet client from the creators of zMUD, designed specifically for Windows XP and Vista. Play over 2,000 text-based MUD games on the Internet. 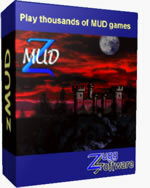 zMUD is the most popular and advanced MUD/Telnet client for PC/Windows. Play over 2,000 text-based MUD games on the Internet. Top rated since 1996. For Windows XP or older. Windows Vista users should buy CMUD.